Indian Prime Minister Narendra Modi has said the administration will reach out to aid those affected by the earthquake on Saturday morning in India and neighbouring Nepal. Tremors of the 7.9 earthquake, depth at 15 kilometers, with its epicenter in Nepal was felt across states in India as well. “We are in the process of finding more information and are working to reach out to those affected, both at home & in Nepal,” tweeted the Indian Prime Minister. Local television networks in India said tremors were felt in New Delhi as well as northern Indian states. 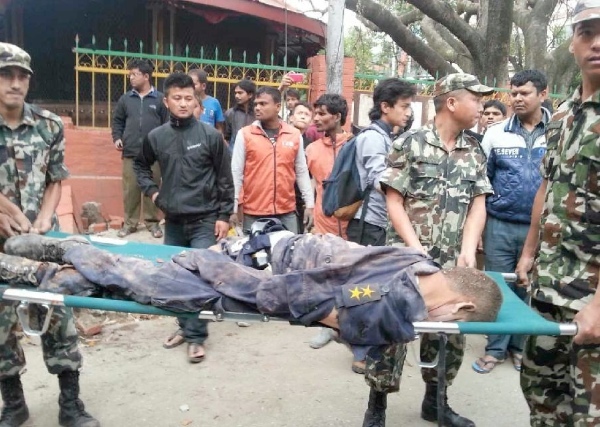 The Nepal government has said more than 600 people have died in the earthquake measuring 7.9 magnitude that struck east of Pokhara in Nepal on Saturday. The US Geological Survey has said the epicenter of the quake is 81 kilometers north-west of Kathmandu, the capital city of Nepal. Photos posted on social media sites including Twitter showed families in Nepal rushing out to the streets, injured being taken to hospitals and damaged buildings. Nepal’s landmark Dharahara tower is among the many buildings reduced to rubble in Kathmandu. Meanwhile, two Indian Air Force relief planes are en route to Kathmandu carrying rescue teams, said a Defense Ministry spokesperson in New Delhi. “One C-130J Superhercules aircraft of IAF has just taken off from Hindan with NDRF teams for Kathmandu. One C-17 Globemaster III will fly later this A/N from Hindan to Kathmandu carrying Rapid Reaction Aero-Medical Team,” said Sitanshu Kar. In a press conference held in the Indian capital of New Delhi, India’s National Disaster Management Agency (NDMA) said on Saturday the death toll in India has reached 34. India should send more relief teams, doctores, para medical, nurse, temp shelters, Army. Food & medicines should air lifted to Nepal. RSS should send 10000 of their social serves team to Nepal to help.